End any special meal with a delicious fudge pie! 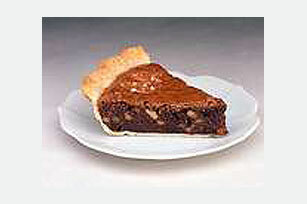 Instant coffee, rum extract, chocolate and walnuts add flavor and richness to our Caribbean Fudge Pie. Preheat oven to 375°F. Microwave chocolate in microwaveable bowl on HIGH 2 min. or until almost melted, stirring after 1 min. Stir until chocolate is completely melted; set aside. Beat butter and sugar in large bowl with electric mixer on medium speed until light and fluffy. Add eggs, one at a time, beating until well blended after each addition. Add chocolate, coffee and rum extract; mix well. Stir in flour and chopped walnuts. Pour into pastry shell. Arrange walnut halves on top of pie. Bake in lower third of oven for 25 min. Cool. Refrigerate at least 1 hour before serving. Balance your food choices throughout the day so you can enjoy a serving of this rich-and-indulgent pie with your loved ones. Substitute vanilla for the rum extract. Prepare as directed, using 2 pkg. (4 oz. each) BAKER'S GERMAN'S Sweet Chocolate.